I was introduced to Rod by Rob whom I guided last week on the Wye. 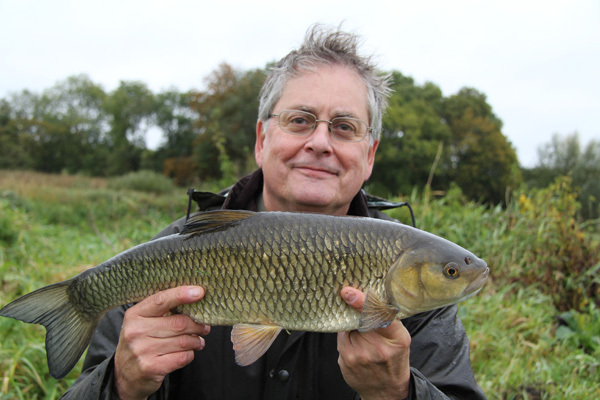 Rod is primarily a carp fisherman who lives in Ringwood on the Hampshire Avon. Since he had lived there he hadn’t cast a line in the river. Now with it being such a close distance I just couldn’t imagine this. So Rod wanted to catch some chub as he hadn’t float fished since he was much younger. So we agreed to meet up at 7.30am next to the river. The forecast for the day was not looking good. Blustery wind with rain on and off all day, which are not ideal trotting conditions. However undeterred we bought our day ticket and wandered off to the river. The level was still low for this time of year but had some colour from rain which had fallen the previous few days, although the Avon does run quite clear. We arrived at one swim where there are normally 12 chub swimming around on the gravel. All you normally do is bait drop some hemp and maggots on the gravel and they soon get their heads down to feed. Today I couldn’t make out any shapes on the gravel before or after bait dropping. This was due to the wind ripple on the river’s surface plus the tinge of colour. We set up a feeder rod with a small feeder and short hooklink with a size 18 hook and two red maggots. I’m not too happy fishing blind because normally I can see the chub coming through the swim. However nothing was seen. We cast out and waited. Nothing came along no plucks or line bites. We gave it about an hour. That was enough for me because you normally get indications of fish in the swim. We then tackled up the float rod. Rod was quite rusty at this and I’m sure he doesn’t mind me saying so. However soon he was mending bows in the line as the float traveled down the flow. The presentation wasn’t perfect but good enough to have got a bite or two. Time was moving on and we had a spot of early lunch in the still pouring rain and formulate plan B. This was quite easy we would float fish a swim that has produced plenty of chub. It’s a swim where they tend to shoal up under a overhanging tree. By catapulting maggots you can get them feeding. So out came the catapult and for 15 minutes I was there feeding the swim, and occasionally you could see the white mouths of the chub coming out and feeding on the maggots. The wind was still blustery and rain was intense and was not going away. However rod stuck to his task really well, however it was difficult running the float through the swim. When he got the run just right the float shot under and he stuck. I had told him to walk back when hooking a fish as you can then pull them to your side of the river. So he did this pulling the chub away from the snag. We were using 4lb hooklink (0.12mm) diameter so he could put a fair amount of pressure on the fish. Soon it was in mid stream and he palyed the fish and we landed it downstream. Not the largest chub however at about 3lbs still his first chub. The wind was making it very difficult to trot the float though for most of the afternoon. He did however have one more fish on the float which was about 4lbs. 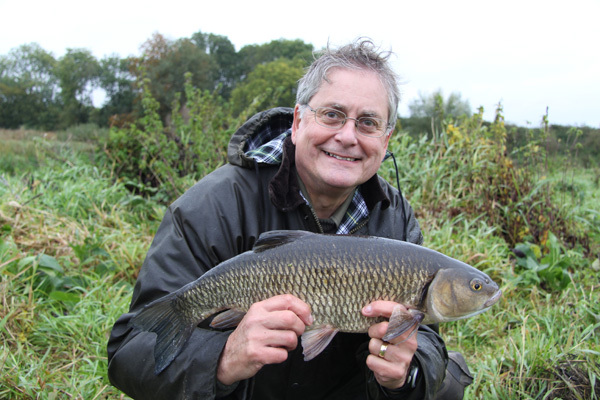 The trick is to continuous feed the maggots into the swim getting the chub to compete for the grubs. This was certainly happening as the chub were now on the shallows where we were catapulting. We could see some monsters there well over 6lbs. So we then set up the swim feeder rod and with the small size 18 hook and 4lbs hooklink. We cast out on the shallow shelf where the chub were feeding and it didn’t take long before the rod trembled and the quiver bent over. So that was two fish in quick succession and landing one. Out went the feeder again and it wasn’t long before Rod had another fish on and he did pretty well to land the thing. It again was a 4lber and beautiful condition. We decided to rest the swim for a while as the chub became very spooky and try our luck in another swim downstream. We fed the maggots and trotted for quite sometime however nothing came along. I had one trot down and hooked a fish which shot straight to our bank most unlike a chub and then bit through the line so I suspect it was a pike. It was getting late in the day now and Rod was itching to get back to the swim where he caught the chub for the last hours fishing. So with the rain still falling and the wind blowing we returned to the swim. There were still chub feeding on the maggots. Out came the catapult and in went the maggots. Again I could see the chub taking the grubs. After 10 minutes Rod cast out and when the float went down the right line I spotted a chub turn quickly and chase his bait down and open it’s mouth. Strike was the call as the float shot under and walk backward was said in the same breath as a big chub fought for freedom as the rod bent. I could see the fish gaining ground and was thrashing around right on the edge of the snag. Walk backwards was said again and as Rod did this the fish came out from the edge of the snag over to our side of the river. It’s such a buzz for me let alone the person on the other end of the rod when these big chub are being fought. Rod did a great job and we netted it downstream. This was a nice chub and on the scales it went 4lbs 14oz. I think Rod was very pleased. Casting in again it wasn’t long before he hooked another chub only for the hook to pull as he walked back. This is normal for this to happen from time to time. The wind and rain still came down and casting was difficult. One cast from Rod had the end tackle tangled in the tree and that was it for the float gear. I pulled Rod’s leg saying that it was my favorite float and that I had a name for it “Timmy float”. We watched it float downstream hoping that someone would find it and put Timmy to good use again. It was nearing darkness now so we changed over to the feeder rig. However the chub couldn’t be fooled into taking the bait, so that was it for the day. 5 chub and a few lost in an afternoons sport was great. I think Rod enjoyed his session as he has asked me to suggest some float tackle. He has the bug. He said he had not experienced anything like this before and living close to the river he could fish for a few hours after work. No loading up the barrow and taking loads of gear. This entry was posted on Friday, October 17th, 2014 at 8:47 am	and is filed under Uncategorized. You can follow any responses to this entry through the RSS 2.0 feed. Both comments and pings are currently closed.